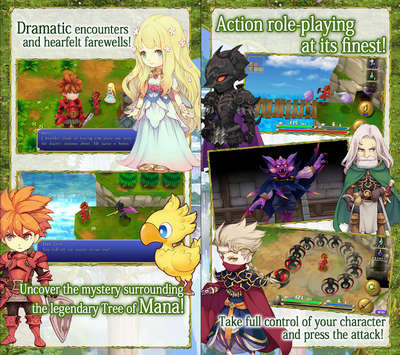 SQUARE ENIX is back with a Final Fantasy Adventure remake called Adventures of Mana in which you fight powerful gladiators and try to survive. This is almost the same as the original game but with some improved graphics! Game is good but there is lots of room for improvement though. Killing enemies feels like swinging a sword on thin air, several show little pain, no sound effect from being hit and they all die on the same manner, they slowly spin/crumble and they light out. No explosions, no bones/particles scattered everywhere, nothing, not to mention they seem to lack AI. Shops don't tell you what an item does; Make the device vibrate when the hero gets hurt. You already have fantastic assets from Rise of Mana, would be nice if you make use of them rather than reinventing the wheel. - Weapons are divided into six unique categories, some with uses beyond merely dealing damage. - From restoring lost HP or removing various ailments, to rendering foes incapacitated or dealing deadly blows, there are eight different spells for almost any occasion. - You will need both tools and your wits to overcome the many challenges encountered in the world of Mana, ranging from locked doors to hidden rooms to traps growing progressively more complex as the game progresses. Install Apk, Extract Sd Data and move ‘com.square_enix.adventures’ folder to sdcard/Android/obb, Run the game and play.